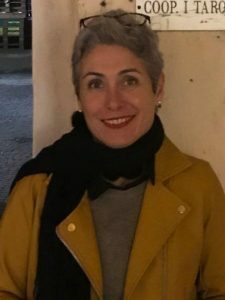 Sara Giudici has been a Slow Food member for many years and joined the Slow Food Aberdeen City and Shire group in 2016 and in 2017 Sara joined the committee. Sara was born and raised in Milan (Italy) but left her hometown in 2004 because of her husband’s job. After working in several different areas, Sara eventually ended up in ‘Bonnie Scotland’ in 2013 where she studied in Aberdeen and achieved her chef qualifications. Sara has always had a passion for food and still remembers the smell of the tortellini she helped her nonna make on Christmas Eves when she was a child. Sara has always been a strong supporter of sustainable, local food and believes in the importance of educating people – and that starts at home where Sara encourages her children to eat food that is good for them, knowing where it has come from, knowing who has grown it and knowing that it is good for our planet. Any spare time Sara has is spent tending the veggie patch and hens her back garden.